When it comes to doing business, the so-called ‘neutral’ Spanish is thought to be the best option one can resort to in order to keep costs as low as possible, reaching the largest possible number of people. But is this always the case? The importance of the Spanish in the global market is undeniable. It is estimated that more than 427 million people speak Spanish as a native language, so if we consider only native speakers, Spanish outranks English. However, as much as Spanish is widely spoken around the world, from country to country – and even within a country – Spanish is as a language full of flavors, with regional varieties which are actually quite divergent from one another. The fact that there are many different variants of Spanish makes it a complex and at the same time rich language. These differences are realized phonologically, grammatically, and lexically. As most of the time language differences are not perceived as a hindrance to communication among Spanish speakers, it may sometimes seem irrelevant to bear these differences in mind. However, a single word can have different effects on Spanish speakers ─ or even be perceived as meaningless! For instance, the word ‘green bean’, ‘vainita’ for Venezuelan people or ‘ejote’ for Mexicans speakers, does not have meaning at all for Argentinians, who call it ‘chaucha’; in the same line, Mexican speakers, would find funny the Chilean word ‘cabritas’, the Venezuelan version ‘cotufas’, or the Argetinean ‘pochoclo’, for the English word ‘popcorn’. And while Chileans and Mexicans keep the English version ‘hot dog’, Argentineans eat ‘panchos’, Spanish speakers ‘perritos calientes’, and Venezuelans ‘perros calientes’. And, Chileans take ‘el micro, el bus, la liebre’, Venezuelans ‘la buseta’ (which is not the same as ‘bus’, a word they also use), Spanish people ‘el autobús’, Mexicans ‘el camión’, and Argentineans ‘el micro, el colectivo, el bondi’. Or when eating out, Spanish speakers ask for the bill to ‘el camarero’, Argentineans to ‘el mozo’, Mexicans to ‘el mesero’, and Venezuelans to ‘el mesonero’. In this way, it becomes clear that what a word means for a Spanish speaker in one community may not even have sense for a Spanish speaker from another community. As Edward T. Hall and Mildred Reed Hall said: ‘…the single greatest barrier to business success is the one erected by culture’. If the Spanish cultural varieties are understood and respected, the target audience will really feel ‘at home’ with a certain product and accept it right away. And in achieving this, localization becomes of crucial. 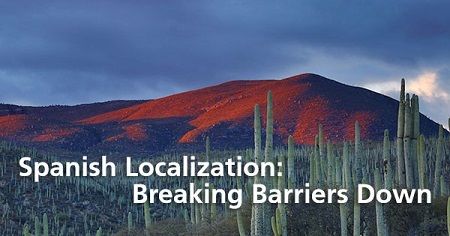 Localization it’s not just about translation. It is about translating with a very special consideration of the cultural aspects of the place where a certain product or service is to be introduced. So in this complex process of conveying an effective message, a team of linguistic experts with different cultural backgrounds working together, and thinking in terms of the related language and culture becomes essential. Remember that a quality product reflects the international markets’ culture, language, and requirements. And while the same product may be applicable to buyers in each market, the corresponding linguistic message is usually not. If you want to explore new markets and learn more about localization and how we work, just contact us! Request a Quick Free Quote or Contact us now!